Today you may need to think about what it is in your life that must come to a final and irrevocable end. This card is associated with the traditional tarot’s Ten of Swords. It refers to an ending that must be faced so that you can not only put it to rest but can also experience — once and for all — the relief and acceptance that’s such a necessary part of attaining closure. 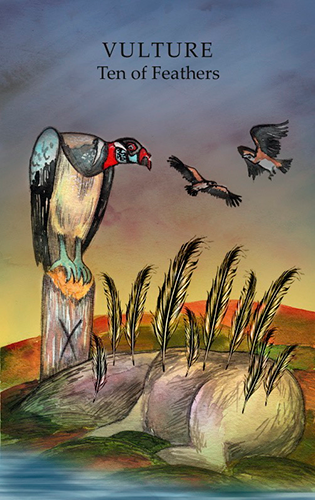 The Vulture — or Ten of Feathers in the Animal Wisdom Tarot — is a carrion scavenger, looking down from a wooden post onto the nondescript carcass of a decaying animal. Ten feathers are plunged into the animal’s flesh, and an X — as in “X marks the spot — is etched onto the Vulture’s perch. The animal may have put up a fight or he may have died from old age or exhaustion — but none of that matters now: he’s dead. What happens to his carcass is irrelevant — or is it? There is the belief in some cultures that carrion scavengers transport the dead up to heaven. And notice the two other birds swooping in for the feast. The sky is dark and ominous but the Sun is also rising in the distance. This is a common feature with the Ten of Swords. In the midst of all the death and destruction there are symbols of rebirth and renewal. The Ten of Feathers encourages you to give up the resistance and finally face defeat. But there’s a sense of liberation that comes from that acceptance, as well as wisdom and maturity. A new day dawns — just as it does in this card — once you allow yourself to give in and put the past to rest. The card used for today’s tarotscope — Penguin — is part of the Animal Wisdom Tarot series by Dawn Brunke and Ola Liola. 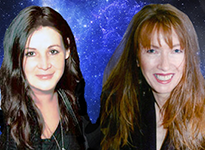 Dawn Brunke is a writer and editor who specializes in the areas of healing, metaphysics and spirituality. She’s written several books on communicating and communing with animals. Ola Liola is a painter with a background in fashion. Her inspiration comes from fashion design, mythology, microscopic world, flora and fauna. The Animal Wisdom Tarot is published by CiCo Books, and used by generous permission.